To all of my fellow gelato lovers, pay attention because I am about to tell you where you’ll find the best gelato on the planet. I know, this is an exciting moment, but try to be calm! Sorry, I get a little bit crazy when I talk about gelato, or really any kind of food. I am absolutely in love with good gelato, and in each new city we visit, my #1 goal is always to find the best gelato in town. This past summer in Europe, Mauricio actually had to limit my gelato intake because that’s where about 20% of our spending was going (and let me quickly add that I feel no remorse). But the obstacle of my budget-conscious boyfriend aside, I still managed to find, not just the best gelato in each city, but also the best gelato in the entire world! And of course, it was in Italy… Where else would you expect it to be? 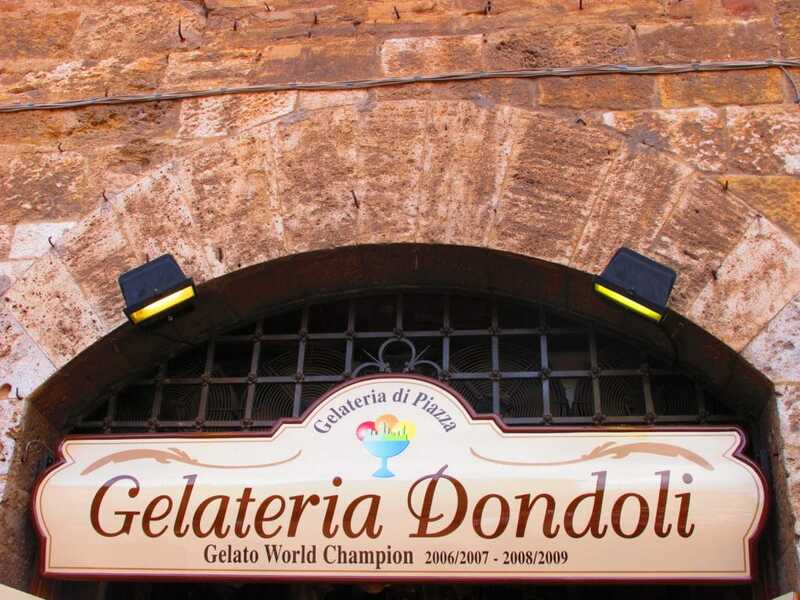 Gelateria Dondoli, which is located in a small town called San Gimignano in Tuscany, has the absolute best gelato in the world. If you won’t take my word for it, then maybe you’ll believe me when I tell you that it was voted “Gelato World Champion” in 2006/2007 to 2008/2009 in the Gelato World Championship (Copa del Mondo della Gelateria). Sergio, the “Master Ice Cream Maker,” experiments with unusual and innovative flavor combinations, while keeping the tradition of Italian gelato alive. Some of his specialty flavors include Goat’s Cheese and Pumpkin, Raspberry with Rosemary, Blackberry with Lavender, Pink Grapefruit and Sparkling Wine, Ricotta and Bilberries, and Gorgonzola and Walnuts. Sergio’s specialty flavors are so creative and interesting, and before, I could never have imagined them in ice cream form. I wish I could have tried all of them; but the ones I did try, Raspberry with Rosemary and Blackberry with Lavender, were soooo yummy. 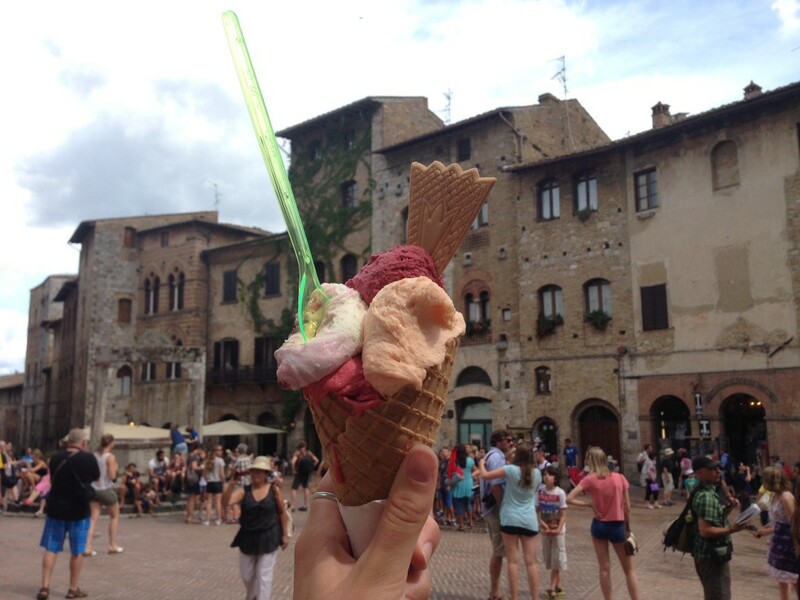 If you’re not so adventurous in the food and/or gelato realm, don’t worry! Gelateria Dondoli also has the typical fruit flavors such as melon and banana, and cream gelatos like sour cherry, cappuccino, and wild berry. Take my advice. Before you hunt for the perfect Italian leather handbag or jacket in one of San Gamignano’s leather shops or become too captivated by the beautiful sweeping views of the Tuscan countryside to do anything else but breathlessly stare, go pick up a one-of-a-kind gelato from Gelateria Dondoli. This gelato will complete your perfect trip to Tuscany, and plus, what kind of person doesn’t instantly become happy at the sight of gelato? I can’t think of a single person. Also, don’t be discouraged by the line of forty people out the door. You will be at the front in just minutes. If anything, be encouraged by the line, because you know it is that good and well worth the wait.